Does your web site help you meet your marketing goals, such as attracting more traffic, generating better leads and converting your visitors into paying customers? If not, you should learn more about inbound marketing. How your web site looks is important, but how it works is even more important! When the two work hand in hand, it's a recipe for success. 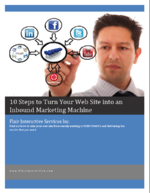 Our new "10 Steps to Turn Your Web Site into an Inbound Marketing Machine" white paper will show you ten simple steps that you can take to make sure that your web site PERFORMS. Don't skip these steps during your next redesign or web site development project. Download the white paper now or contact us to start getting better results from your marketing.